We have just entered the National Museum of Vietnamese History in Hanoi and already I like this place. Perhaps it’s the friendly ticket office staff followed by the young guard who greets us shyly at the door, or is it the beautiful building itself. I’m obliged to place my backpack in a free locker, but there’s no problem keeping my camera around my neck and taking pictures. Within minutes I’m quietly embarrassed by my ignorance of Vietnam before now. Like many others no doubt, the US-Vietnamese war of the 60s and 70s represented the extent of my knowledge and even that, I realise has been rather vague. Entrance to the National Museum of Vietnamese History. No.1 Trang Tien Street, Hoan Kiem, Hanoi. I’ve heard a few people say, “Oh, I don’t like museums,” as a reason for avoiding such places. However, I’m learning that museums around the world now are far more dynamic in their presentation concepts than perhaps the rather musty offerings of years gone by. You can’t get a more fascinating museum than Erawan in Bangkok, located inside the belly of an elephant! Yes, I have to say, historical education in many of today’s museums is very enjoyable. So back to Vietnam – First of all this museum is stunning. Considering the contents, the building itself is quite new, French colonial period completed in 1932 in a design style called Indochina architecture. Large open spaces with grand pillars, marble floors and a careful blend of lighting. Each display and artefact includes helpful information tags, in both Vietnamese, French and English. The space allows us to roam comfortably. There are no crowds today, but perhaps on school holidays and other key dates there will be. It’s a good introduction to this fascinating country and city. Here’s a helpful travel guide to Hanoi for first time visitors. The grand interior hallways. 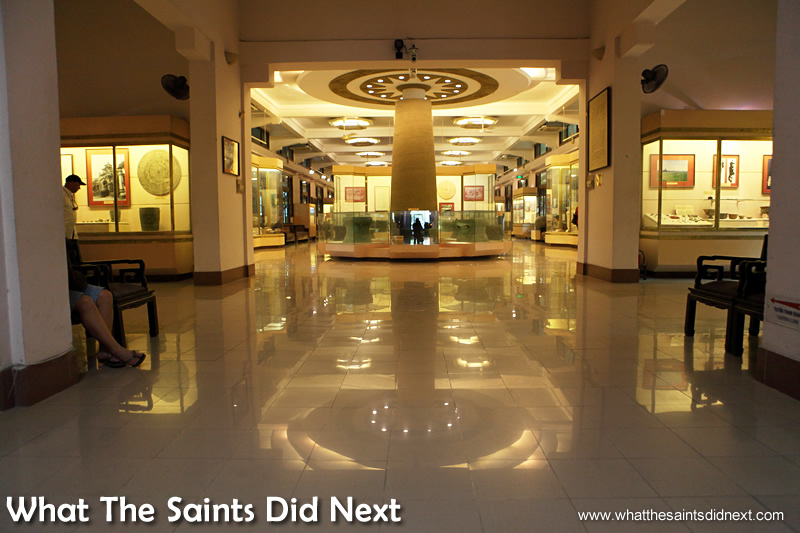 The National Museum of Vietnamese History. Admiring a painting depicting President Ho Chi Minh’s Hanoi speech on 2 September, 1945. 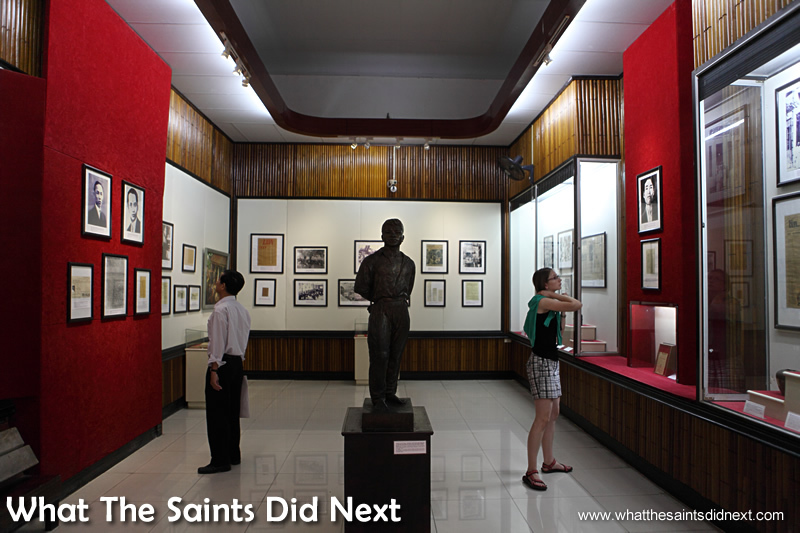 The National Museum of Vietnamese History. Early 20th century oil lamp supports made of ironwork, in the shape of bamboo with dragon, Phoenix motifs. 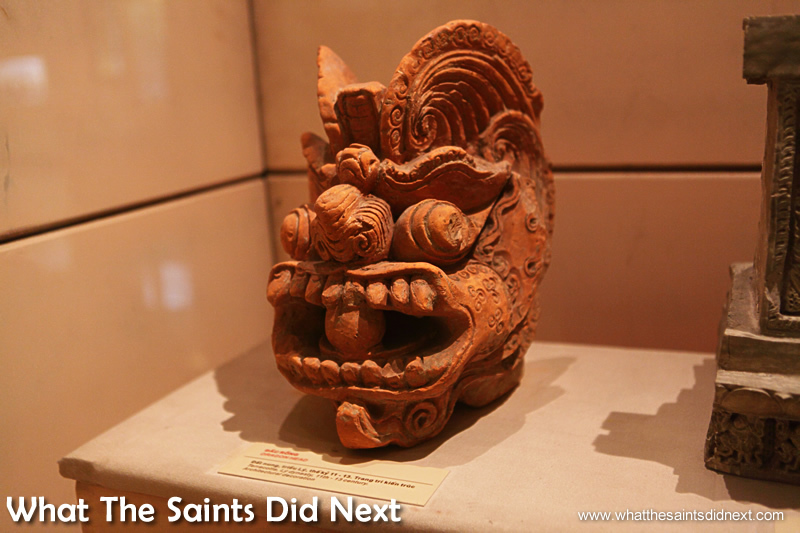 Skull and human bones from the Can Gio district in Ho Chi Minh city. 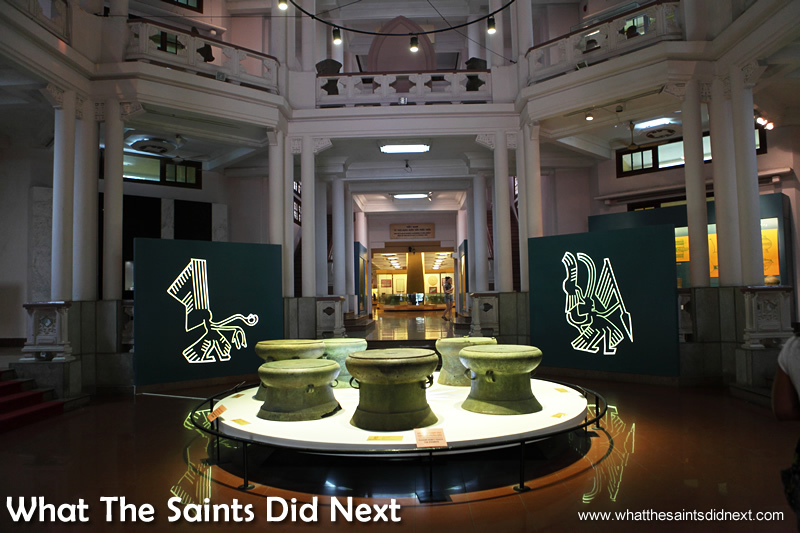 The large bronze drums from the Dong Son culture, dating back 700 BC, is the first display, subtly emphasising the point that this country is steeped in culture and history, far richer and deeper than what I may have learned from television and the movies. In fact, archaeological excavations have revealed the existence of humans in Vietnam around 500,000 years BC, in the Palaeolithic age. The Dong Son drums are bronze drums fabricated by the Dong Son culture. They were initially used as one kind of important musical instrument, but gradually became the indication of the Dong Son tribe leader’s power and the cultural symbol of ancient Vietnam. The drums were fabricated by a lost wax casting technique. They are large in size and symmetrical in shape with sophisticated decorations. The drums help to reveal somewhat of living, working and fighting activities as well as the nature and human philosophy in the Dong Son era. Dong Son drums are objects representing the intelligence and excellent skills of Dong Son people – extracted text. 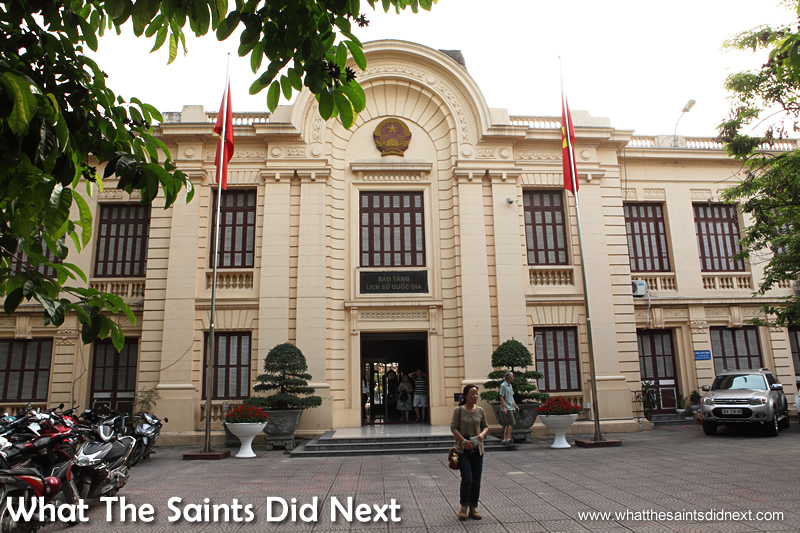 The National Museum of Vietnamese History. The name tag says it all. Bronze from the Co Loa site, Dong Anh district, Hanoi. There are many examples where bronze was used in the manufacture of arrowheads and the triggers of crossbows. Pearl inlay decorating a carved wood wardrobe, Nguyen dynasty, from the early 20th century. Ancient agricultural tools can be seen that were used to work the Lacs, or rice fields. These include crude looking instruments with bronze blades fixed to long handles and other contraptions that give an insight into how manual the labour of the time was. Tools include bronze axes, hoe and ploughshare. There is also pottery from the Dong Son culture. 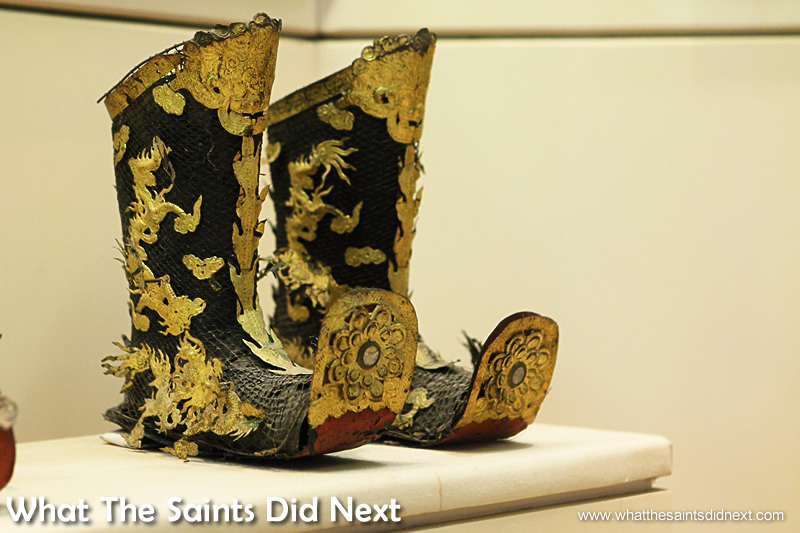 Mandarin boots made from gilded metal. Nguyen dynasty, 19th – 20th century. Objects for worship. Examples of Mandarin robes. 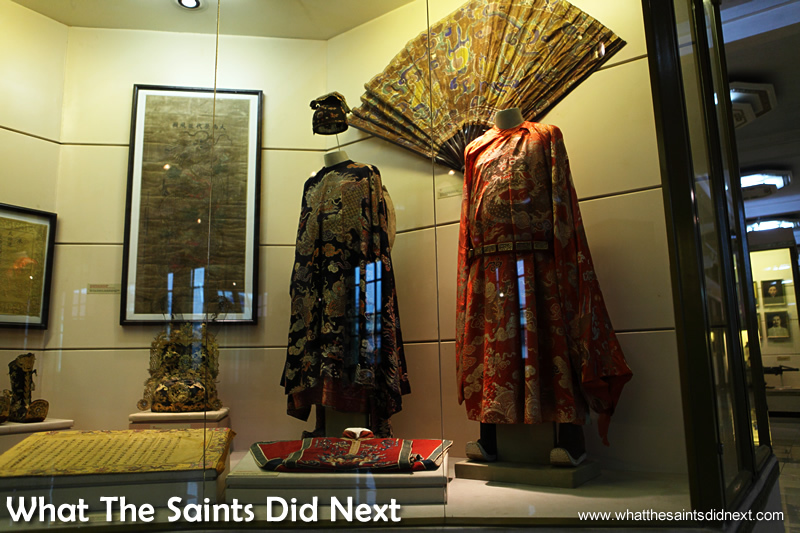 Embroidery from the Nguyen dynasty, 19th – early 20th century. Statue of Avalokitesvara (Kuan Yin) Buddha with many eyes and arms. The statue is 3.7m in height, 2.1m wide and is made from crimson and gilded wood. 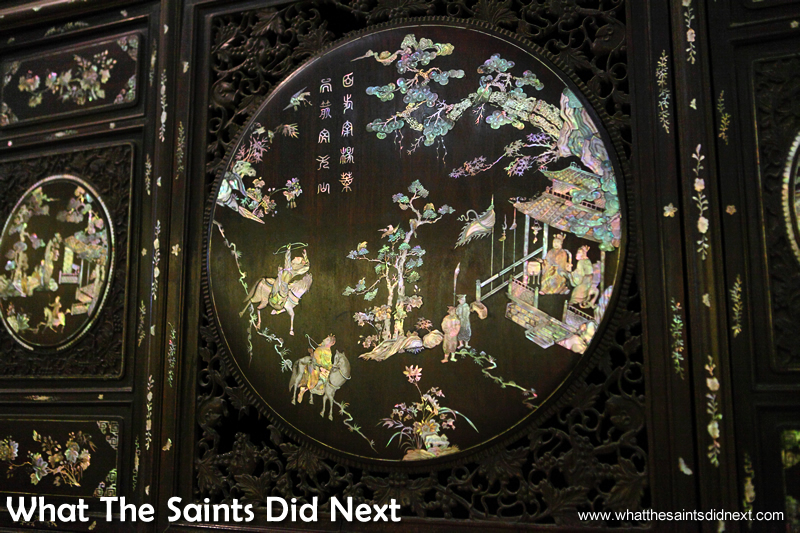 This restored piece is from the Le dynasty, Autumn of Binh Than year (1656). Artist: Truong (family name). But Thap pagoda, Bac Ninh province, Northern Vietnam – extracted text. One of the most dramatic items is a huge coffin, 4.5m long and dating back 2,500 years. Coffin. 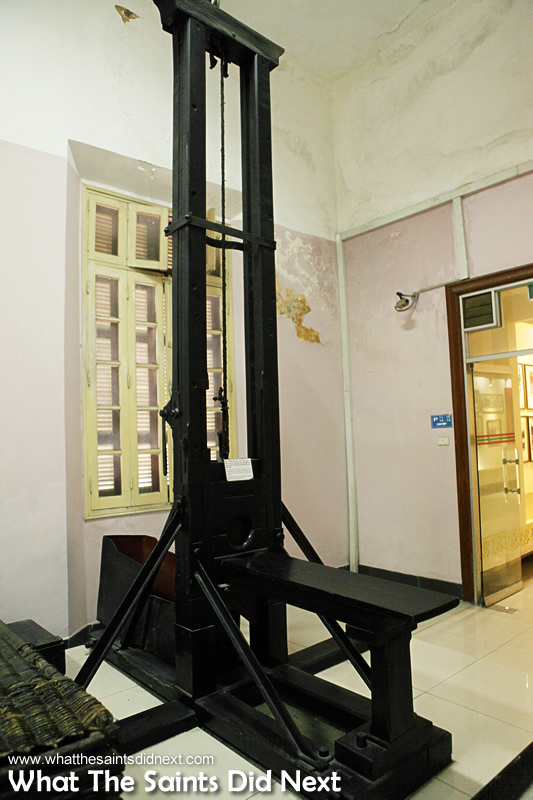 450cm x 57cm (largest part, 77cm). Dong Son culture, circa 500BC. Excavated in 1961 in Viet Khe village, Thuy Nguyen district, Hai Phong City, Northern Vietnam. The National Museum of Vietnamese History. Terracotta Dragon Head – Ly dynasty, 11th – 13th century, made for architectural decoration. 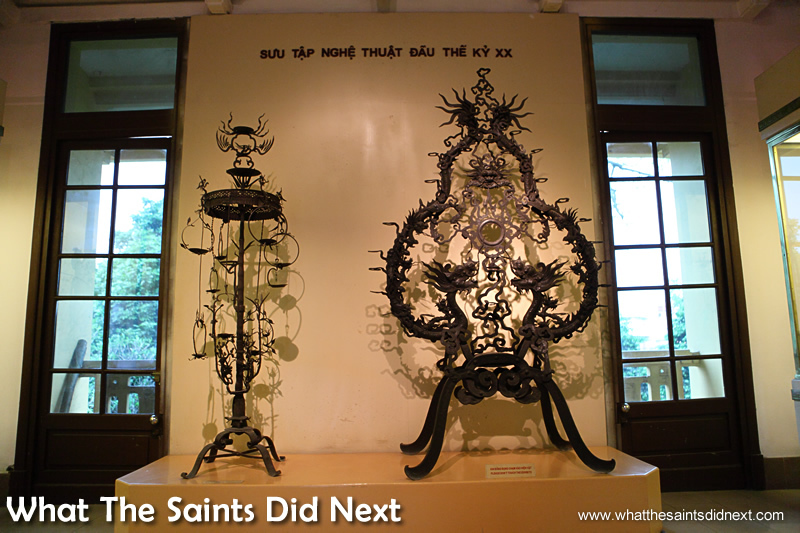 Many of the items on display have been excavated from, “The Mekong Delta, one of the three great centres of the Metal Age in Vietnam. In Dong Nai culture, a great number of moulds have been discovered dating from about 2,500 years ago, which show the bronze and iron production were well developed in this period. Large hatchets with curved blades, long pointed knives, and sickles as well as statues were produced. Gold was also used in the making of jewellery in addition to precious stones and bronze. Pottery took many shapes and forms of decoration distinct from those of the common cultural roots of the Dong Nai Culture in this period.” – extracted text. 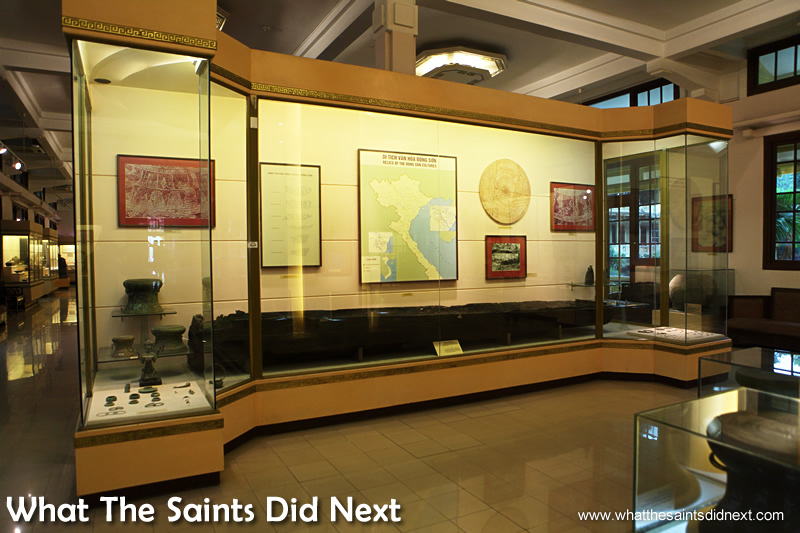 Detailed displays show off items preserved from various ruling dynasties in Vietnam, including: The Ngo, Dinh, Early le Dynasties; The Ly Dynasty; The Tran Dynasty; The Ho Dynasty; The Le So, Mac, Le Trung Hung Dynasties, The Tay Son Dynasty, The Nguyen Dynasty. 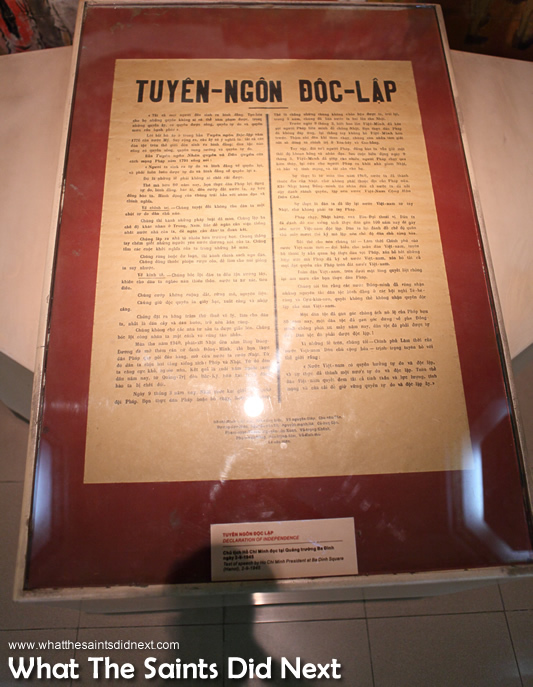 A much more recent item but just as important is the Declaration of Independence, a copy of the text of the speech given by President, Ho Chi Minh, at Ba Dinh Square, in Hanoi, on 2 September, 1945. The museum itself is spread over two buildings, the second located directly across the road. By following the suggested tour route the presentations run pretty much chronologically, so building number two brings us right up to date with modern Vietnamese history. The second building, previously known as the Revolution Museum. The National Museum of Vietnamese History. Inside the second building. The National Museum of Vietnamese History. The second part is not as impressive in terms of architecture, but the displays are once again spacious and well laid out with helpful labelling and signage guiding visitors around in the right order. 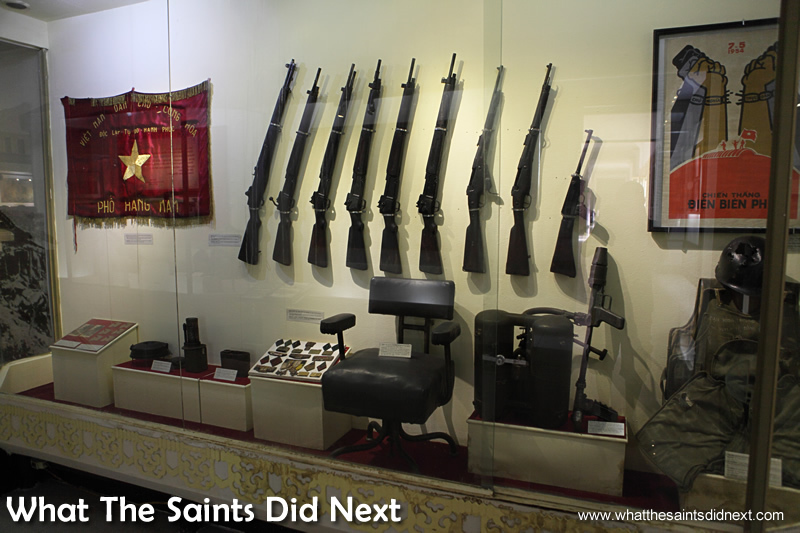 This was previously known as the Revolution Museum, but has since been unified as part of the National Museum of Vietnamese History. The presentations here focus more on the periods of conflict in Vietnam’s distant and recent past. There is plenty of space given to documenting the period of French occupation, nearly 100 years, from 1857 to 1954. The French invasion was driven by a desire for a larger share of Asian territories conquered by the West. The last of the French army leaving Hai Phong, northern Vietnam on October 15, 1955. Weapons used in the struggle against the French. The National Museum of Vietnamese History. 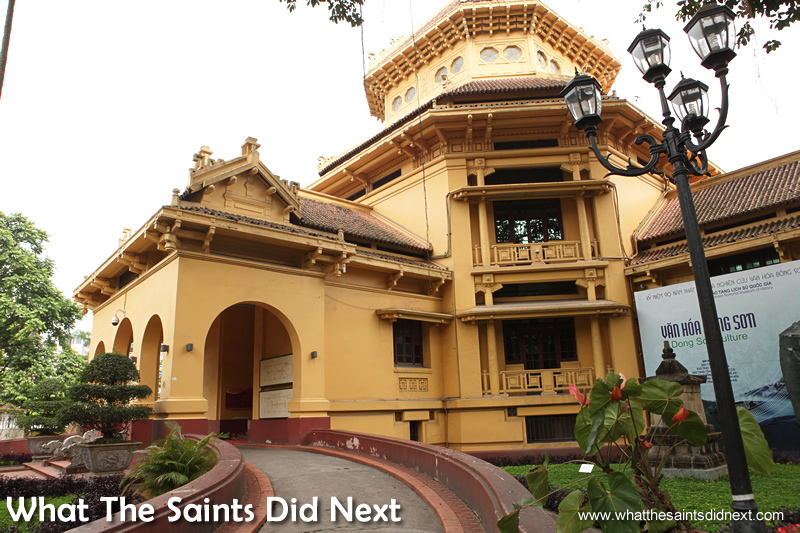 President Ho Chi Minh’s significant contribution to Vietnam’s development is given due prominence in this building. 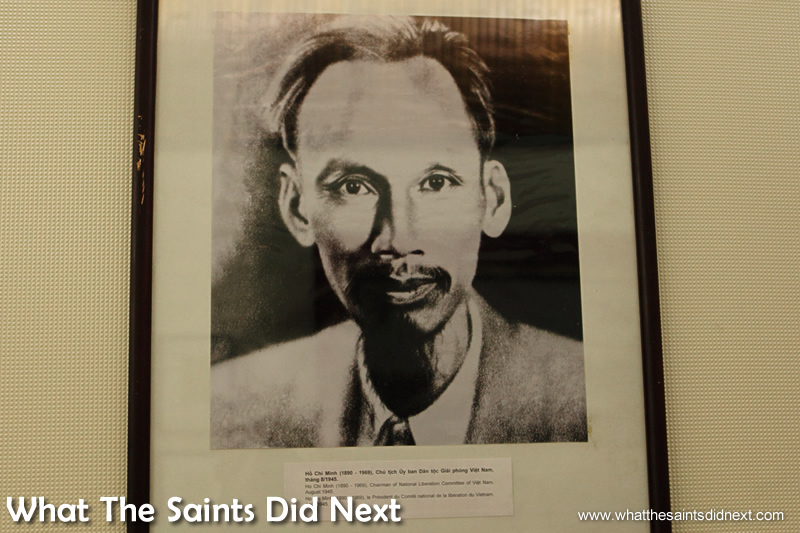 Ho Chi Minh (original name Nguyen Sinh Cung, also called Nguyen Tat Thanh) was founder of the Indochina Communist Party (1930) and its successor, the Viet-Minh (1941), and was president from 1945 to 1969 of the Democratic Republic of Vietnam (North Vietnam). As the leader of the Vietnamese nationalist movement for nearly three decades, Ho was one of the prime movers of the post-World War II anti-colonial movement in Asia and one of the most influential communist leaders of the 20th century. He died on 2 September, 1969 in Hanoi. Typewriter used by Comrades Luong Khanh Thien and To Hieu while working for Trade Union Movement in District No.2, Hai Phong City during 1935-1936 period. The final display rooms documents stories and accounts of the US-Vietnamese war of 1964-1973 and the subsequent fall of Saigon in 1975 after north Vietnamese troops completed their push to take the whole country. The tail of a bomb used to bombard Thach Ha district, Ha Tinh province by American aircraft in September, 1968. Mortar squad of female guerrilla fighters in Tinh Bien district, An Giang province. 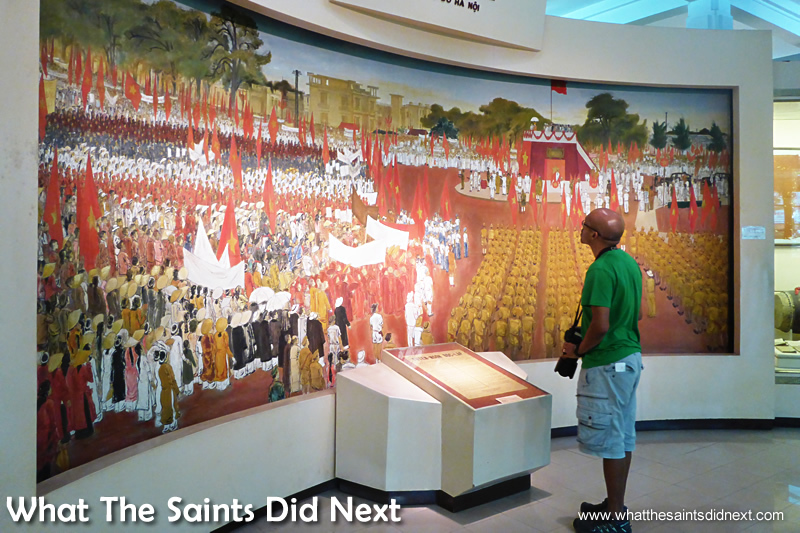 I highly recommend a visit to the National Museum of Vietnamese History, as it is impossible to do it justice in the scope of this post. Admission is just $1 (USD) so it is excellent value. It has helped me have a better understanding and appreciation for Vietnam; the people and the culture which will add valuable context for the rest of our visit. 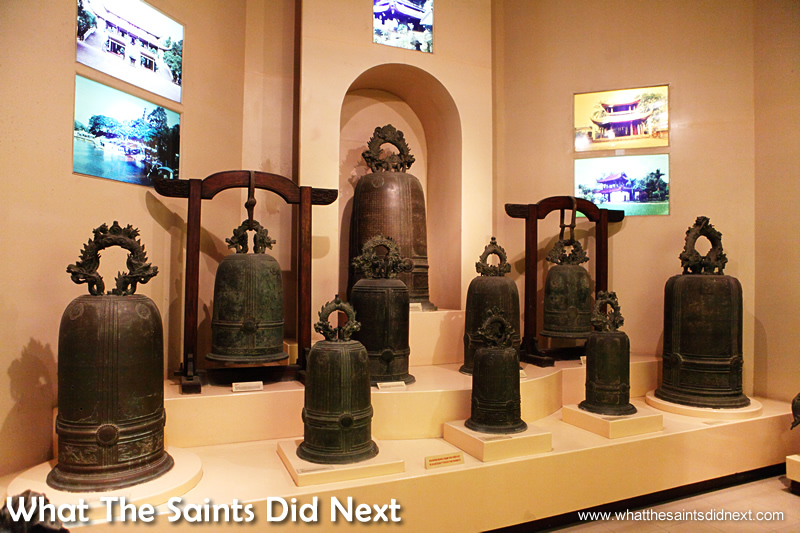 Bronze bells, Nguyen dynasty, 2nd year of Bao Dai reign (1927), Hoi Dong temple. Ritual use. The National Museum of Vietnamese History. Great that those guns on St Helena were rarely fired in anger. Always appreciate your input John. Yes, we’ve been learning all of this too and does leave us with a heavy heart. Will look up the links, cheers.